Whether you're the host or you want to bring something yummy for the potluck, we know that it has to be easy to prepare but delectable enough to make all the guests happy. 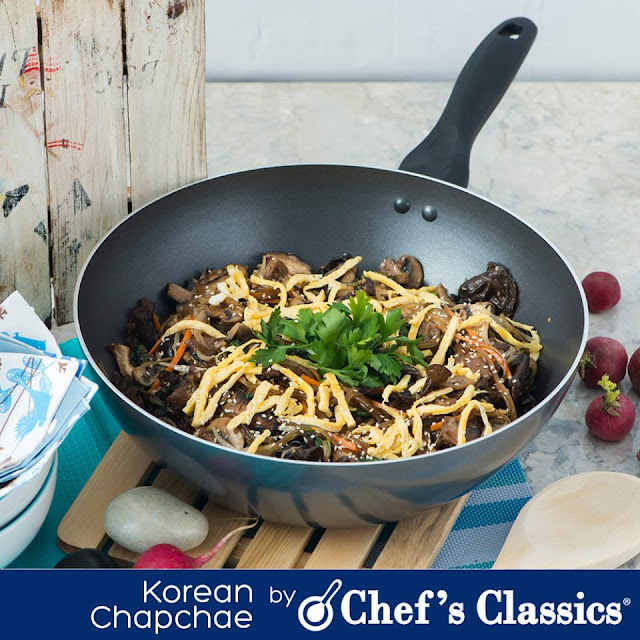 How about serving Korean Chapchae? Put a Pinoy twist to this Korean favorite. Here's how to prepare one. 1. Soak cellophane noodles in water for 30 minutes and cut into moderate length. Drain, then set aside. 2. Mix one tablespoon of soy sauce, one tablespoon of sugar and one tsp of sesame oil. Add the beef and marinate for 30 minutes. 3. Heat vegetable oil in a Chefs' Classics Daisy Plus Wok. Saute onion, ginger and garlic. 4. Add the marinated beef, carrots, mushroom and spinach. 5. Season with salt and transfer to a bowl. Set aside. 6. In the same wok, bring the water to a boil. 7. Cook the noodles until tender, and drain. 8. Season the noodles with 9 tbsp of soy sauce and add sugar. 9. Mix the cooked noodles and the cooked vegetables. Finally, add sesame oil. 11. Serve topped with toasted sesame seed.